I just got back from a very brief trip to NYC…. while there, I attended the New York premiere of Hairspray (and actually enjoyed it! ), dined with friends, and hit up a couple of New York’s fabulous new hotspots (Beatrice and Rose Bar are my faves). For the premiere, I opted for the sultry summer red look – red dress, red lips. On my lips I used Cover Girl’s Mocha Mist, 235 and topped it off with Kiehl’s Golden Berry Light Lip Gloss. Summer hair calls for no fuss… thus, I ran a comb through it, applied some of the Kerastase oil and let it air dry. For a night out with the girls, I wanted to look a little edgier – classy with a rock and roll edge. I chose summer dark eyes (not black, but a greyish, olive color) and light lips. Again, no fuss, au natural hair. On my eyes, I started with Nars’ All About Eve, a fabulous, opalescent base, then painted the crease with MAC’s Saturnal Frost (from their limited edition Summer collection – I adore this color! It makes my golden eye color really pop!) 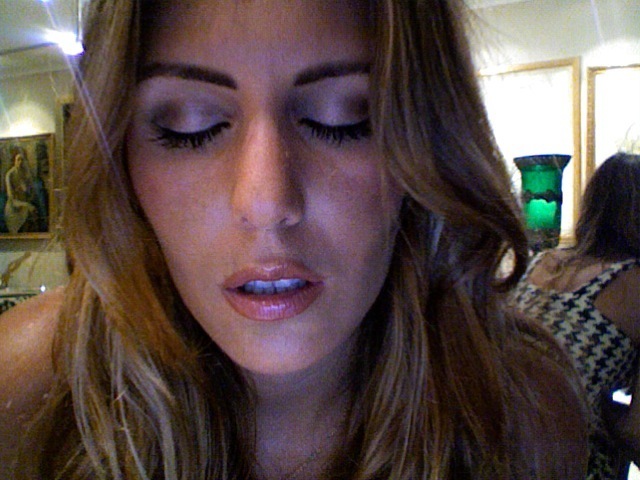 I used Express GLIMMERsheer from Beauty Addicts on my brow bone and my cheek bone. It’s an awesome pearlized highlighter that I adore. I chose Nars’ Outlaw for my cheeks (a little dark for summer but I figured hey, I’m single… I wanna attract some attention). And I ended with my new favorite mascara… Cover Girl’s Volume Exact in Black. The wand is rubber allowing you to really get close to the lashes edges. Plus it makes my lashes super long without that hideous clumping!